Just in time for UTSA Football at the Alamodome! The Institute of Texan Cultures brings "Football The Exhibit". "Football: The Exhibit" encourages hands-on participation from start to finish. Areas of the exhibit focus on collisions, peripheral vision, reaction times, trajectories and balance. Visitors can explore these ideas with the Grip Tester, Bicycle Wheel Gyro, Passing Cage and other activities. Guests can look back on the early history of football and society’s obsession with the sport in the Football and Society zone. Also, the Institute of Texan Cultures has developed its own special section highlighting Texas’ unique football culture, “Texas Football: In Their Words.’ Coaches, cheerleaders, bandsmen, fans and parents take turns answering, "What does football mean to you?" "Football: The Exhibit" is a traveling exhibit organized by the Arkansas Museum of Discovery." 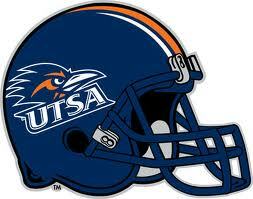 And for those interested in UTSA Football, season tickets can still be purchased. Check out the UTSA Football website. Go Runners!